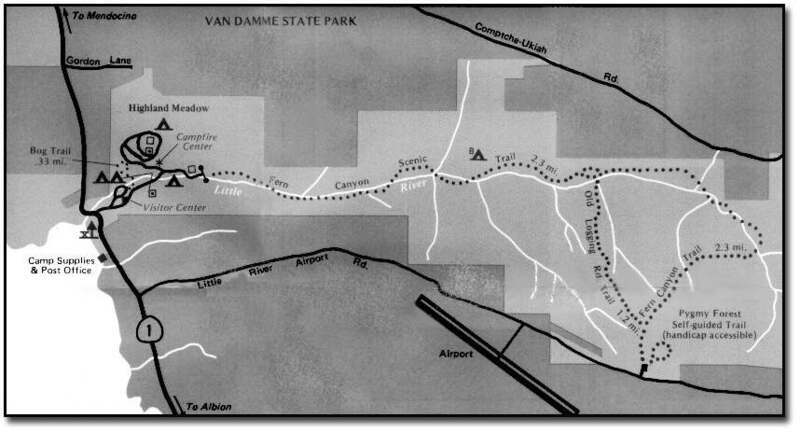 The trail at Van Damme is called the Pygmy Forest Discovery Trail. This fascinating pygmy forest in Van Damme showcases unique forests of low, stunted trees and shrubs caused by a complex ecological condition associated with underlying wave terraces and their unusual soils. The poor soil fertility and wetness of the soil restricts the growth of vegetation and induces a dwarf condition in many of the plants. These trees may be 100 years old or older. They are able to survive in this soil but they surely do not prosper here. How can soil scientists be sure that the soil has produced this pygmy vegetation? Growing nearby on soils that have been rejuvenated by erosion and fresh deposition, full size redwood trees can be found.